About the most massive langsax I have, challenged only by one other. 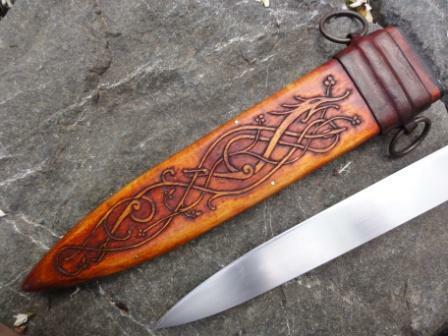 Very impressive and attractive: I like all of it, but the carving on the handle is very elegant. 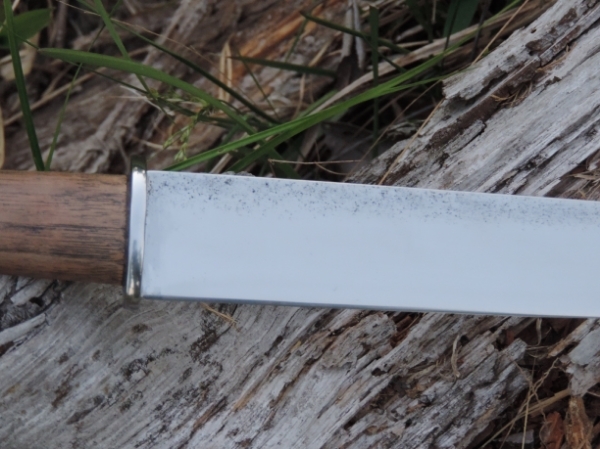 Also, a very nice long seax. 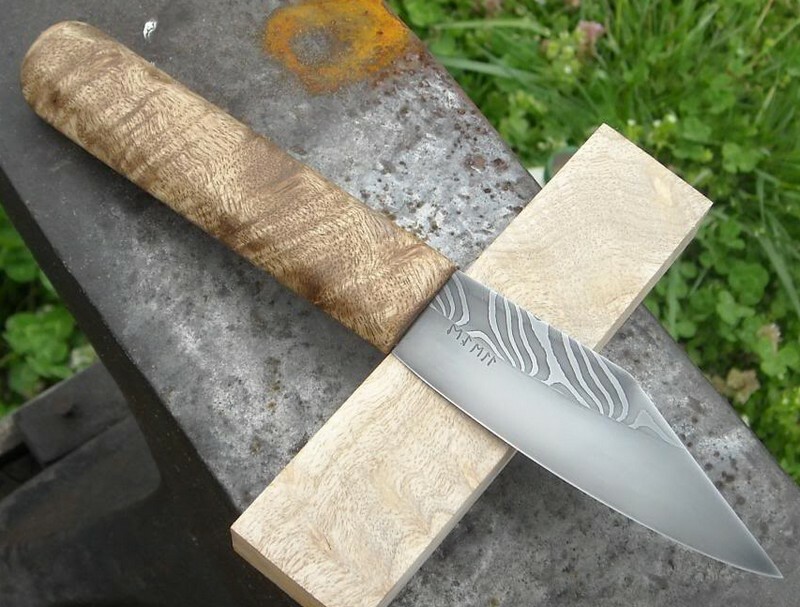 Oh, Tinker still makes knives and swords but at his own pace, and is not currently taking commissions, but he does post things he made that are available for immediate delivery: Good to have a look at his web site once in a while. I just purchased a " IDKE Fantasy Fighter " from him and I should be getting it soon. ( Not the one pictured on his web site but another one very much like it ). IDKE stands for " I don't know either ". Oh, when I re-handle the Kris Cutlery Seax I bought recently I'll post a pic here on this Topic thread and are more complete DIY Topic maybe with a few in progress pics. This whole Topic is very useful to see all the different ways that people have made some very differently styled handles, and I may get inspired by elements in many of them including some low relief carving I want to do. Perhaps this one for something different? A bit less historical than I usually go for, but a beautiful blade. It has ore from a meterorite in the mix. Wow, very nice work Phil! I like the proportions of the blade & handle. The carvings and wood choice are beautiful. Looks like it handles very well. The scabbard is still missing, I hope I'll manage to make it within week or so. Actually, it took far more time I anticipated - a lot of things happened to me, some of them quite unpleasant - but finally I managed to made this scabbard. Honestly, I'm very pleased by the result. 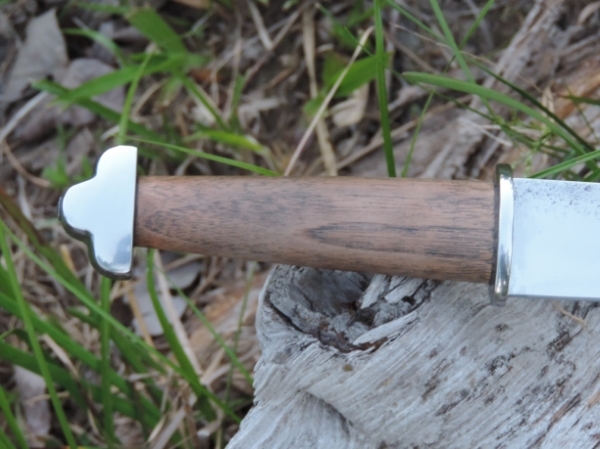 The making of the scabbard followed the same trend as the seax itself - very limited, only where it's almost mandatory, use of electric power tools. 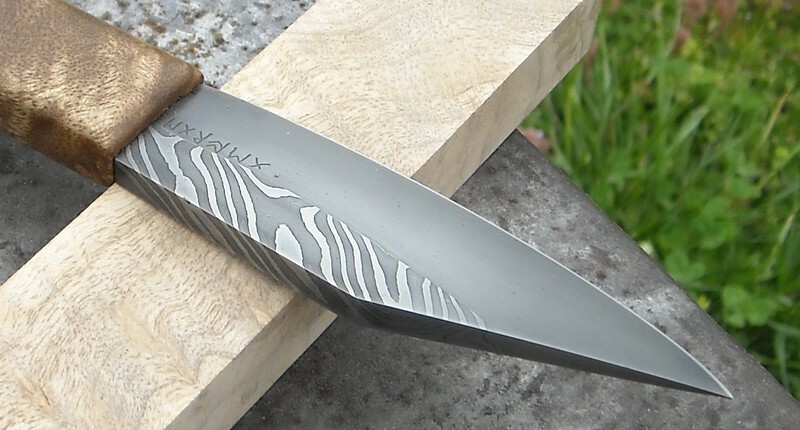 Made Bye Master Knife maker Randy Hass . Handle -Walnut Burl carverd bye his talented wife. For his first viking langsax he did truly amazing job !!!!!! Wow, nice scabbard Boris. I really like the colors used and the cut-outs in the metal. Is that bronze or brass that you used? Hey Tim, Looks like another score. I like the shape and carving on the handle. When are we going to see "Industry Professional" under your name?! How you find the time for side-projects between your large-scale projects and everyday life eludes me. Your brass work is very attractive! Thanks a lot, guys! I appreciate! I used both of them. The fittings were made from brass, while the rings are bronze. Additionally, I used copper for the rivets. I'm not sure, but hope this would happen soon. In any case, it depends only on the community. 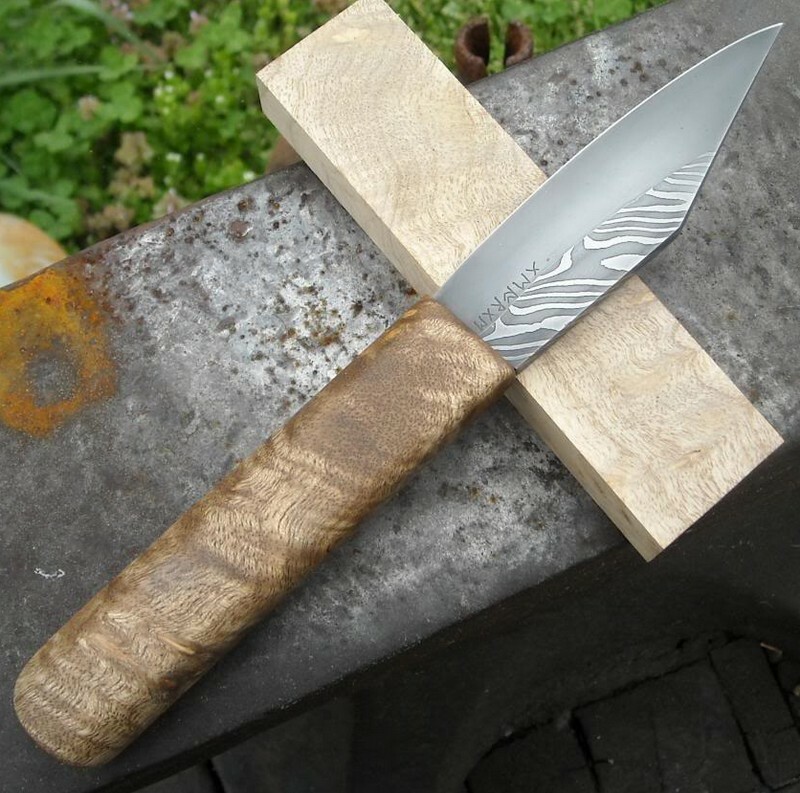 Something I've just finished, a 7th century English seax and sheath based on two very similar finds (one from Southampton and one from Suffolk). 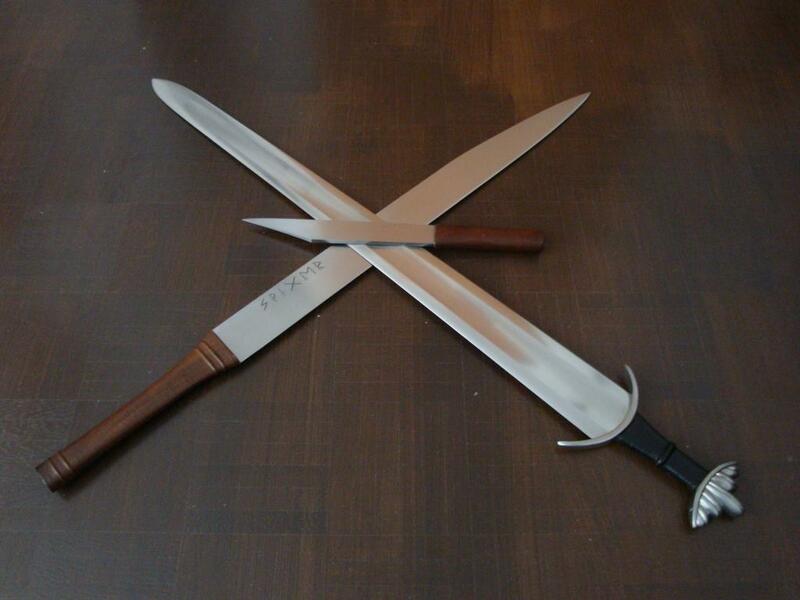 P/W blade by Paul Binns, stud castings by Blue, both of whom did excellent jobs of making exactly what I wanted. Very nice all around, but I am especially impressed by the scabbard! Really outstanding. Here is my latest addition, by George Ezell. The blade is a 11 layer 1084/15n20 twist on the back, with a 1095 edge, and is 92mm long, 5mm thick, and very sharp. The runes spell out George Ezell, which is a nice take on a maker's mark. The handle is laurel burl. 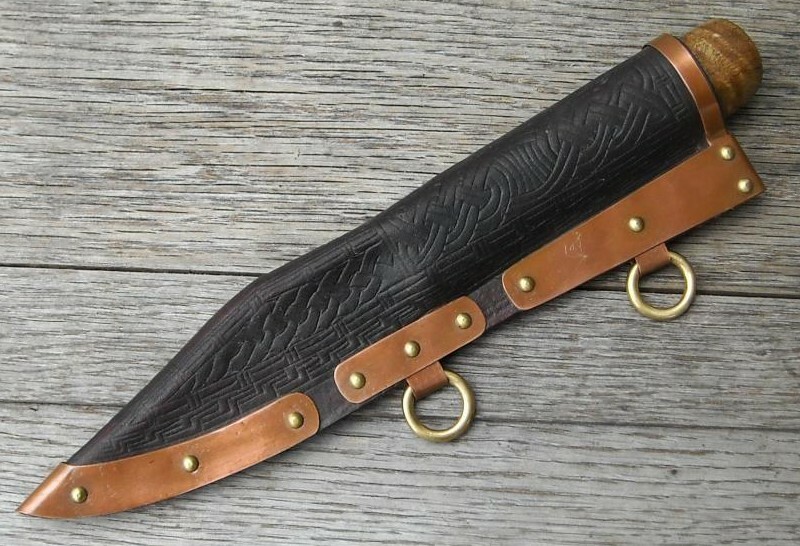 The sheath is leather with copper fittings and brass rivets and rings, and looks great. 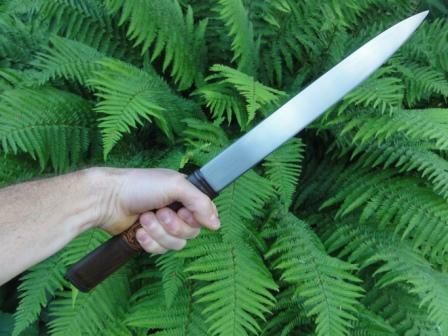 I have been wanting a small seax like this for some time so when the opportunity presented itself I did not hesitate. This is my first knife by George Ezell, but I hope it will not be my last. I love the Stealth Bomber on the chape! I've never noticed this similarity so far. Honestly, I've never intended to get such result. Well, this was posted elsewhere, but to keep my favorite string alive I added her in here. This is by Luke Shearer a new, but very accomplished smith. 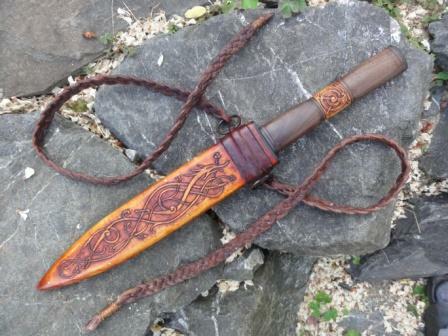 Anyway, early this summer I saw this seax he was making and arranged to purchase it. 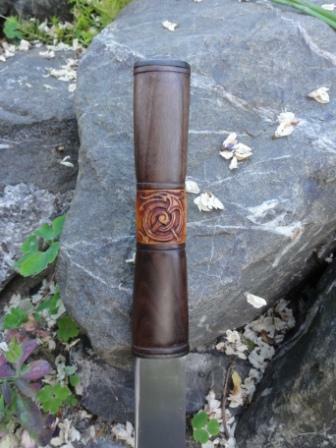 When finished it went straight to George Ezell who created this sheath for it. Great work to set off the knife. Another highly recommended craftsman! 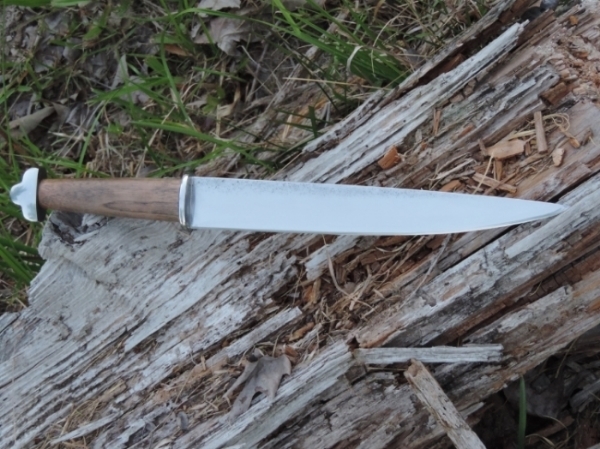 The Seax is named Warg Tooth, which I will change to a slightly more Anglo Saxon version. The work strongly reminds me of Owen Bush’s work and has a Kentish Notch along the spine. The blade is 11 inches long. 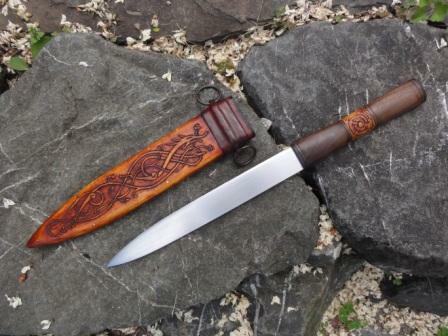 Here is my new seax from Iron Badger on the Armour Archive.